 use diverse language strategies. For everyone who has completed the French Level I, II, & III -- and can't wait to continue. French Plus includes real-life situations and complex conversations with expanded vocabulary. This program greatly increases your ability to discuss everyday topics in only 10 days. 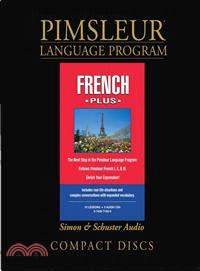 Note: In order for the Pimsleur Method to work correctly, you must first complete the Level I, II, & III language programs before proceeding to the "Plus" Level language program.